In 2007-2009, Scottsville Museum presented the story of our town during World War II in an exhibit, entitled, "Small Town, Big War." The exhibit honored those who served in the war and those who served at home. Fifteen young men from Scottsville died in combat - that's a lot for a small town - and almost everyone had a family member in the service. 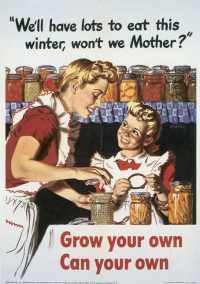 On the home front, women and children planted victory gardens, drove the tractor, rolled bandages for the Red Cross, collected scrap metal and rubber to be recycled into munitions, and waited for letters. The exhibit included photographs of veterans and their stories, a WWII Army command post, a parlor and a kitchen from the war era, a world map showing where Scottsville residents served in the military, examples of letters sent home, an excellent collection of airplane models made by a boy during the war, and many other items reflecting this period in Scottsville's history. Please visit Scottsville Museum in person when you can. Our exhibits about Scottsville's local history are always interesting. For visiting and contact information, see: Visiting Us.